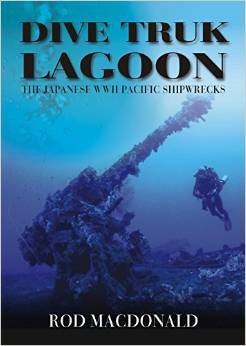 Dive Truk Lagoon is essential reading for anyone planning a trip to this remote part of the world. Chuuk – or Truk as it was known during World War 2 – has a reputation as one of the world’s top diving destinations, thanks to a jaw-droppingly long list of pristine shipwrecks. The armada lying at the bottom of this beautiful Pacific atoll is the remains of the Japanese merchant fleet, which was at anchor here in February 1944. This was late in the war when the tide had turned against Japan, and the US Navy was working its way across the Pacific, going around islands where possible (if they were safely cut off from re-supply), or retaking them and neutralising by force. Truk is a massive fringing reef that provided safe anchorage and a forward operating base to the Japanese fleet. Earlier during WW2 the huge Japanese battleships and aircraft carriers had refuelled and departed from Truk, and it was essential as a fuelling and arming port. Although slow to identify this, the US finally realised that it had to be destroyed if the Japanese navy was to be defeated once and for all. The mission was known as Operation Hailstone, and unsurprisingly it involved an immense show of air and naval military power. In the days before, senior Japanese officials had become nervous and ordered their naval vessels to leave Truk. So when F6F Hellcat dive bombers appeared in the skies over the atoll on February 17th 1944, it was only the merchant vessels re-supplying that the pilots could see below. Nonetheless, the attack was on. The effect of the brief fighting was dramatic. At least 47 Japanese ships were destroyed, and around 270 aircraft. Not a single US vessel was sunk. Rod Macdonald is a familiar name in the diving fraternity, not least for his published back catalogue of historical accounts and comprehensive dive guides. His new book ‘Dive Truk Lagoon’ straddles the two, although leans towards the latter. His guidebooks tend to appear in hardback, which might challenge you to pack it when luggage space is at a premium (if you’re off to Micronesia, you’ll definitely need to pack smart.) This does make it more durable though, as paperback guides often disintegrate rather easily. There are wrecks at a range of depths to suit all abilities in Truk lagoon, even if its remote location is most attractive to those of a technical bent. Rod’s writing approach is to produce a couple of chapters setting the scene and the outcome of Operation Hailstone, before describing in great detail a range of dive sites. His long term illustrator friend Rob Ward has sketched the wrecks once more, in a style that will be familiar to any owners of Dive Scapa Flow or Dive England’s Greatest Wrecks. In all, there are 38 detailed descriptions of the Japanese merchantmen, including Rio de Janiero Maru and nearly intact San Francisco Maru. Later in the book, the author turns his attention to Japanese aircraft wrecks in the lagoon, including Zero (‘Zeke’) fighters, a ‘Betty’ bomber and a flying boat. It’s a rich and hugely detailed work that is interesting enough for this reader when he was sat on a British sofa. For anybody planning to travel halfway round the world and see what lies beneath Truk lagoon for themselves, it’s pretty much a must-read.